Alcohol might be prepared by using the given methods. This reaction is appropriate for the preparation of primary, secondary and tertiary alcohols. 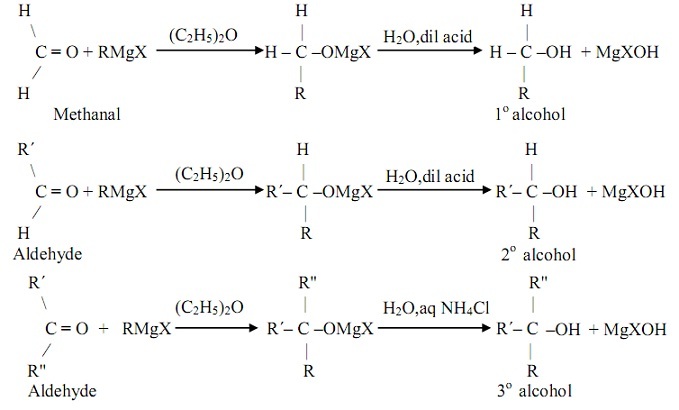 All the halogenoalkane whenever heated under reflux with aqueous potassium hydroxide solution are hydrolyzed to yield an alcohol. This reaction is just the addition of water molecule to the alkene to form the corresponding alcohol. It comprises the addition of concentrated tetraoxosulphate (VI) acid first to the alkene to provide alkyl hydrogen tetraoxosulphate (VI) which whenever treated with water (hydrolysis), provides an alcohol. Industrially, hydration of ethane is taken out in the vapor phase by employing tetraoxophosphate (V) acid supported on silicon (VI) oxide as the catalyst. The reaction is taken out at high temperature and under pressure. Organometallic reagents (RLI or RMgX) react by aldehydes and ketones to provide alcohols. In this reaction, the intermediate alkyl magnesium halide is hydrolyzed by employing the dilute acid or aqueous ammonium chloride in the case of tertiary alcohols. 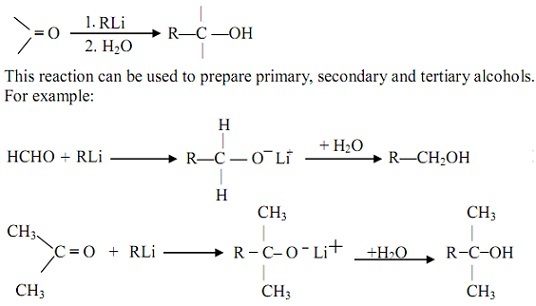 Primary and secondary alcohols can be made up from the reduction of aldehydes and ketones by utilizing Lithium tetrahydridoaluminate (III), LiAlH4 in dry ether. Lithium tetrahydridoborate (III), LiBH4, in dry ether, a milder reducing agent can as well be employed as the alternative reagent. Industrially, ethanol can be made up from the fermentation of carbohydrates. The biological catalysts, enzymes, found in the yeast maltase break-down the sugar molecules to the ethanol to give a yield which is in the region of 95 percent. Glucose is rarely employed in practice as the initial substrate has some other appropriate and cheaper raw materials like potatoes, cereals and rice are available. The percentage of ethanol can be increased through distillation of the reaction product: to give a mixture having 95.5 by mass of ethanol and 4.43% water. The mixture is termed as rectified spirit having a constant boiling point of 78.2°C. Anhydrous calcium chloride can't be utilized to eliminate the residual water as reacts with alcohols to form compounds of the kinds CaCl2. nC2H5OH. On distilling over quicklime, CaO that reacts with only water however not with the alcohol, absolute alcohol (99.5% alcohol) is obtained. The last traces of water can be eliminated from this by refluxing it by metallic calcium and redistilling. Absolute ethanol is highly hygroscopic and should be stored away from the atmospheric moisture if its purity is to be maintained.